As a veteran myself and father of a decorated Navy SEAL, I have a deep appreciation for the brave men and women who willingly put their lives on the line to defend our nation. 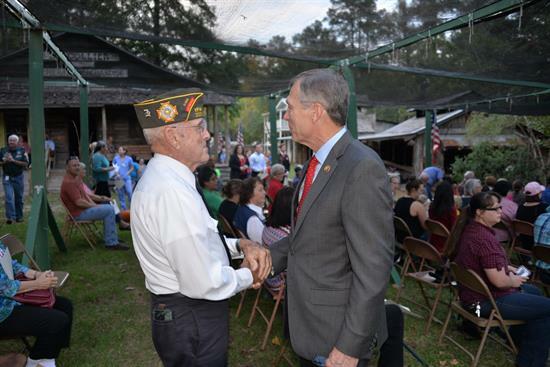 In Congress, I am proud to represent over 50,000 veterans that call the 36th Congressional District home. I am committed to seeing that all of our nation’s veterans and their families receive the respect and treatment they have undoubtedly earned and deserve. Each year, we hold veterans town hall meetings across the 36th District to bring the Department of Veterans Affairs (VA) directly to our local veterans. We have an experienced staff dedicated to serving veterans and advocating on their behalf before the VA. Any veteran with a casework issue should call my office immediately at the phone numbers on this website for assistance. Our office hears firsthand from our local veterans about the specific problems they are having with VA medical care, compensation and simply not getting answers to their questions. That’s why I have actively supported and voted for legislation making it easier to fire VA employees who are failing to properly serve veterans. While most VA employees are trying to do their best to serve veterans, we must do more to change the culture at the VA to ensure our veterans have timely access to the services and benefits they have earned. Orange District Office 1201 Childers Rd.